You know how it feels when you absolutely rule over a look. We all have our strengths. Sometimes it's a dress that absolutely changes your demeanor once you put it on. You get more confident, sassier, and it seems like people are ready to bow down in your presence. Or that's how it should be, at least. Sometimes that feeling comes from a certain place or your favorite song. Here's the thing. There's a way to instantly get that feeling of confidence no matter where you are and what you're listening to. All you need is a gorgeous head of hair and it won't sure hurt your ego if it's infused with magical twists of royal purple! You'll feel like you're stepping out of a fairy tale when you put on this wig. 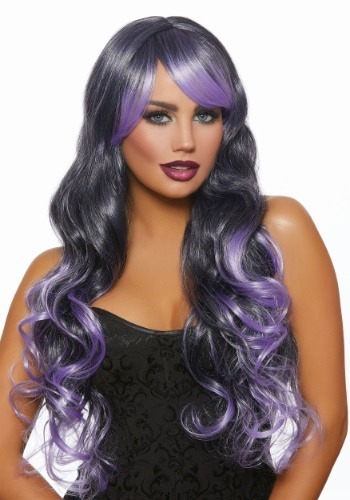 In tones of subtle silver, black, and purple, this wig twists into lovely ringlets that fall long past your shoulders. It's adjustable with an elastic band so if you need a slightly smaller size you won't need to bother with bobby pins. So, whether you're topping off a costume or you're just making a night out extra special, you're sure to feel a little more intense once you put on this show-stopping number! No matter what the costume is any look can always be fully transformed with a wig. Wigs allow you to go from wearing a costume to becoming a character. This black and purple look pairs wonderfully with a variety of costumes from a whimsical witch ensemble to an entertaining showgirl costume, and even a dark and intense queen. When you've got a head of hair this lovely, doors seem to open up for you! No matter what costume you're pairing this wig with, you're sure to transform into a mistress of disguise!